The true story of Queenie the Elephant. There was a time when for tuppence you could ride on the back of an elephant at a zoo. Queenie was one such elephant. Until her death in 1945, she patiently carried up to 500 people a day. 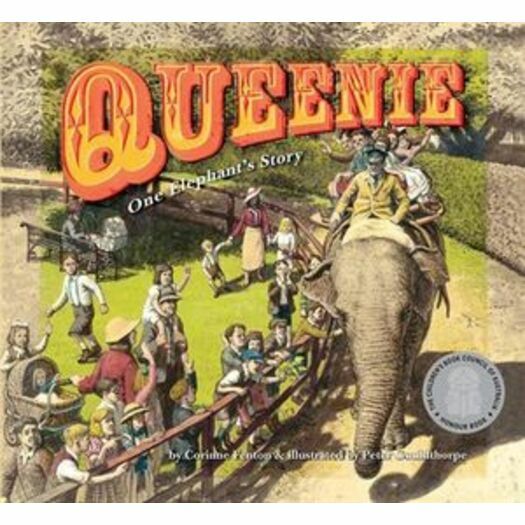 QUEENIE: ONE ELEPHANT'S STORY is an exquisite picture book evoking a time when elephants were giving rides in zoos all over the world. This true story is beautifully told by Corinne Fenton and is brought to life by award-winning illustrator Peter Gouldthorpe.